Radiant, Shimmering and Enchanting are just a few ways to describe diamonds. Every diamond has its own unique characteristics, and it is these characteristics which determines a diamond's rarity and overall value. In the jewelry manufacturing industry, we have adapted a system called the Four C's, this system allows us to carefully measure, categorize and grade each diamond individually. The carat weight of a diamond is measured in several ways. For example, if we use grams to measure a one carat diamond’s physical weight it would be equal to 1/5 of a gram or .20 grams on a diamond scale. We also subdivide a one carat diamond into 100 points or 1.00 points. It is not uncommon to set diamonds that measure .005 points in fact it has become very trendy in certain designs over the last few years. Clarity refers to the presence or lack of blemishes and inclusions that occur naturally as the diamond is being formed deep within the earth. It is safe to say that the vast majority of diamonds have imperfections within them. Some imperfections can be seen with the naked eye; generally these diamonds would fall into the I1-I3 (Inclusions Level 1 - 2 - 3) end of the clarity scale. 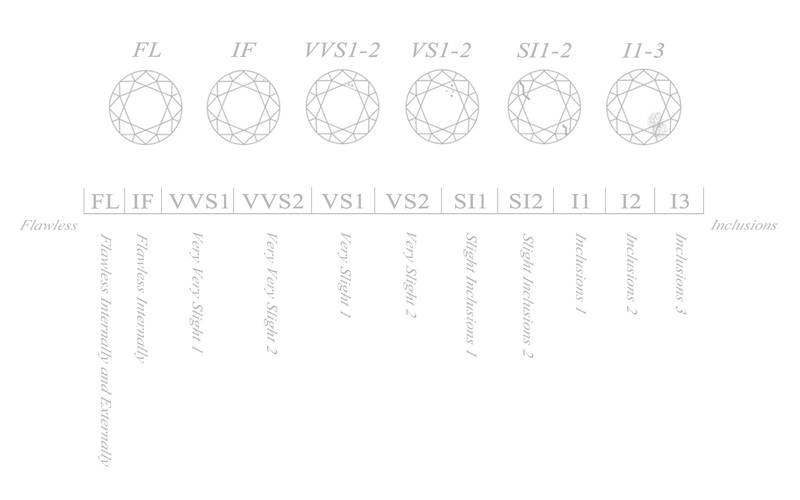 As for imperfections that cannot be seen with the naked eye and require the use of a 10x power microscope or loop, these diamonds would fall into the SI1 - SI2 (Slight Inclusions Level 1 - 2) range. As you work your way up the clarity scale you will notice VS1 - VS2 (Very Slight Inclusions Level 1 - 2) as well as VVS1 - VVS2 (Very Very Slight Inclusions Level 1 -2), this group requires an expert eye to identify any imperfections including the IF (Internally Flawless) and finally FL (Flawless internally and externally) range. In this upper portion of the clarity scale you are then within the rarest, most desired and expensive diamonds on the market. A diamond's color can be measured on a scale ranging from “D” colorless, or pure white to “Z” light yellow. Using a master set, a gemologist can determine a diamond's place in the color scale. The differences are incredibly subtle, but to a trained eye and careful analysis, a gemologist is able to identify the diamond's color or lack of color and assign it a grade. It is also interesting to note that diamonds also come from the earth with beautiful tones of red, pink, green and radiant shades of blues. These incredible colors are not graded using the same method outlined in the graph, but are graded on the basis of the brilliance and depth of its colors. These unique attributes is what will determine a diamond's quality and price per carat. Cut grade refers to the alignment and symmetry of the diamonds facets. 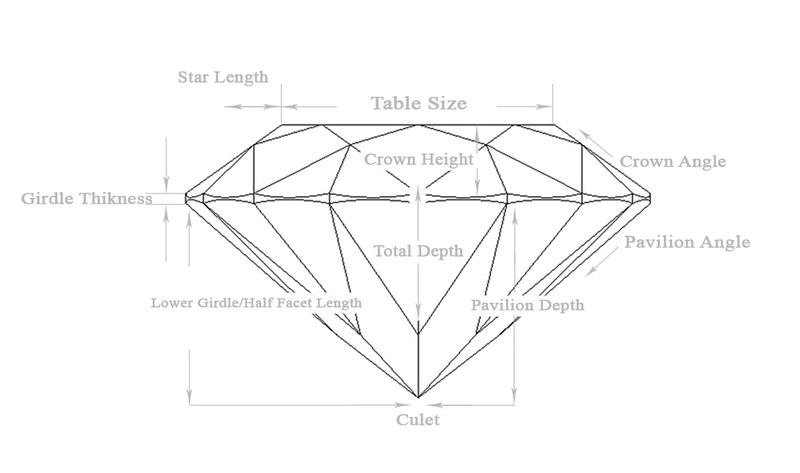 The table, crown, girdle and pavilion is what reveals the true brilliance of each diamond. If the diamond is cut too deep, it will not reflect light properly, resulting in a dull reflection. A diamond that is cut shallow will appear flat when looking straight down on the table, there will be a lack of brilliance to the diamond. The perfect cut will reflect light like a prism, allowing the light to bounce off the facets, and reveal a radiant sparkle throughout.